Create elegant and appetizing trifle desserts, fruit salads, and pasta salads and showcase them in this Anchor Hocking Oneida 89269 96 oz. trifle glass bowl! This clear, round bowl is perfect for displaying layered desserts and eye-catching side dishes. Elevated on a stand, this trifle bowl will heighten the appearance of your simplest dish to add a professional and classic touch to your table. With an opportunity to present your most creative and colorful foods and desserts, this trifle bowl is an excellent addition to any glassware collection. 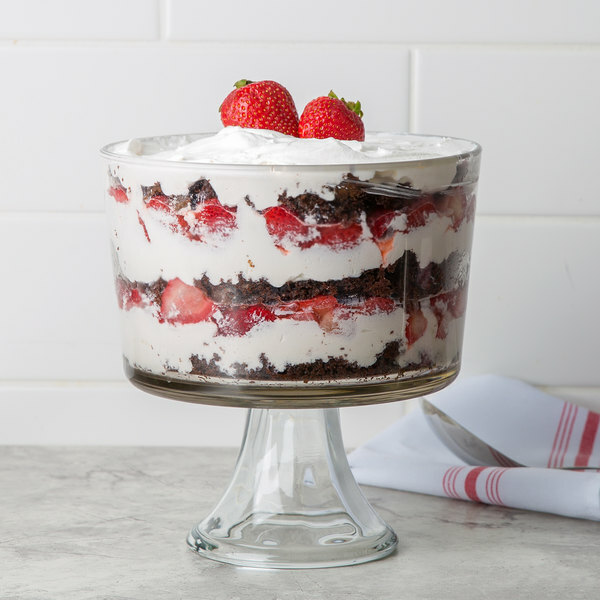 The Trifle glass bowl is heavy and sturdy. My only issue is that, the inside of the bowl, on one side of the glass is not smooth but the other side is. Is not very noticeable when its filled and the good side is shown. Although this is plastic and could break if dropped, it is quite thick and heavy and should last a long time. This has great versatility. I really like it. Good seller. Fast shipping. LOVE THIS product. The glass is super thick and durable. We sell so many of these and customers are always happy!! They fit our mousse and fruit trifles. At 3 quarts, this trifle dish is rather substantial. It makes it super easy to serve a beautiful layered trifle dessert or even to display a gorgeously fruit salad. This bowl is beautiful in addition to being very well made, love the thickness of the glass and it’s very deep to hold your beautiful dishes! The glass trifle bowl is very sturdy and heavy duty. The bowl is stylish and is perfect for layered deserts and salads. Very easy to wash and a great value. 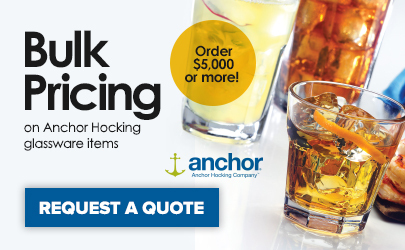 Buy these Anchor Hocking 89269 Presence 96 oz. Glass Trifle Bowl to use for my candy table display. Love the quality and durable glass. Great price. This glass is so thick on this trifle bowl. I use it a lot to make tiramisu trifles and layered banana pudding. It cleans really easily and doesn't scratch. Alas this was the largest trifle bowl I could find so it had to be used as a secondary service method. It's a glass trifle bowl, does the job and better for decoration or small events due to the size, or, to have multiple trifle bowls. Good product, easy to wash.
this is a nice product. It has enough weight to it to be sturdy but easy to carry. It can be used for trifle desserts, fruit, and other things too. This bowl will make any dessert, fruit, or salad look wonderful. It is made of thick glass and it was packed and shipped perfectly with no problems. Currently being used as a fruit bowl and it looks so cute! This bowl has so many uses. Made of strong glass and not super heavy. It definitely lives up to the anchor hocking name. 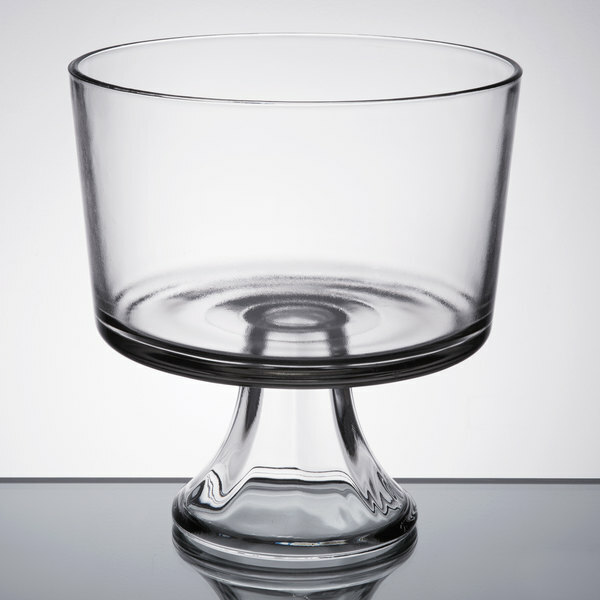 Can't go wrong with clear glass footed bowl to feature fruit salad or layered dessert. We have used it for just one event so far but it seems to be heavy enough glass that we expect it to hold up to our needs. Love these trifle bowls. We use these for catering on our buffet and everyone loves them. We use it for more then just trifles. We like to put cold side or salads in them. I am using these dishes in my ice cream shop to make huge sundaes for parties. They are nice and sturdy and don't break easily. This trifle bowl has a very clean design that allows your dessert to take center stage. I had a difficult time finding a trifle bowl without designs in the glass. I personally feel like those look dated. This one will not have that problem. The height also allows your trifle to really stand out. They are heavy and can withstand constant use. Easy to clean and look as good as new every time. These jars were a great deal and worked perfect for the candy and cookie bar at this high school prom. The fact that you got two matching jars for a great price was a bonus.